Triple Lemon Cake was inspired by the fact I didn’t have any good chocolate on hand. Frankly, I wanted to make brownies, but duty called in the form of a bunch of lemons and an open jar of curd. This recipe was adapted from one in Fine Cooking and requires two 8×2 inch deep cake pans. It turned out all my 8 inch cake pans were only 1 1/2 inches deep, so I had to adjust the recipe and make it in three pans. I also streamlined it a bit to cut down on appliances and bowls, and at the end of the day, I think I liked my way better than Fine Cooking’s because I had a better ratio of cake to lemon curd. Speaking of which, when it came time to fill the cake with lemon curd, I decided that this cake deserved its own fresh batch and not just what was left of the jarred type in the refrigerator. Plus the recipe left me with 5 egg yolks to use up, so why not? Fine Cooking’s lemon curd recipe was perfect as is and I’d use it again. If you are looking for an easy lemon cake with lots of fresh lemon flavor, here it is. It is kind of a lot for just 3 people, so I think we’re going to eat a few slices the squash it up and make cake pops. 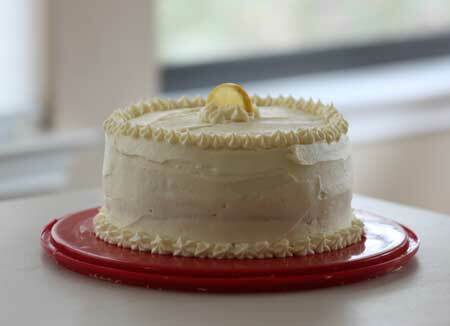 Scratch lemon cake with lemon curd filling and lemon frosting. Preheat oven to 350ºF. Spray three 8 by 1 1/2 inch round cake pans with flour-added baking spray or just grease generously and dust with flour. Mix the flour, baking powder and salt together in a medium size bowl and set aside. In the bowl of a stand mixer using the whipping attachment, whip egg whites on medium speed until foamy, add cream of tartar, increase speed to high, beat until whites just hold stiff peaks. Scrape them into a second bowl to wait. In the stand mixing bowl, the same bowl you used to whip the whites, mix 1/4 cup of the sugar with the lemon zest, stirring it around to make an aromatic lemon sugar. Add the softened butter and beat with the paddle attachment until creamy, then add the remaining 1 ½ cups sugar and beat until light and fluffy. Add a little of the milk and beat just until blended. With the mixer on low speed, add flour mixture alternating with remaining milk in 3 batches, scraping sides of the bowl. Add about 1/4 of the whites to batter and fold in with a heavy duty scraper, then fold in remaining whites gradually. Divide batter evenly between cake pans and smooth tops. Bake for about 28 minutes or until tops are brown and a toothpick inserted comes out clean. Let cool for 10 minutes, remove from pans and let cool completely on rack. Spread the top of two cakes with lemon curd and stack so that you have three layers and two levels of lemon curd filling. Let cake stand for about 30 minutes while you make the frosting. Frosting: In an electric mixer, beat butter and lemon zest until light and fluffy. Add confectioners’ sugar gradually and beat well. Add lemon juice and beat for 1 minute. Add milk as needed until you get a creamy, spreadable consistency. Wow what an elegant Lemo cake! So pretty. Beautiful decorating. I love not only the taste of lemon cakes, but the fragrance on your hands after zesting lemons! Also you can use up the egg yolks for the curd so not so much waste…Thank you for another great recipe! What a pretty cake! 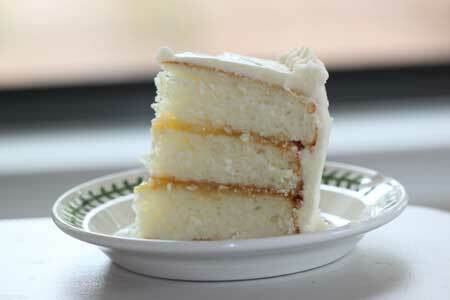 Lemon cakes are so light and refreshing! The cake is beautiful, sorry it will be mashed up. But what better reason than for cake pops!! That looks so good. I love lemon cake. They’re always so light and refreshing. Unfortunately this usually means that I eat too much of it (in theory) :). If you’re serious about making scratch white, yellow or lemon cakes, you might as well get some cake flour. Do you have room in your freezer? Cake flour freezes well. Looks lovely! I’m always afraid of cake flour (where am I going to keep even more baking supplies in my little kitchen?) but I should take the plunge next time I need to make a cake! Cake balls are the solution to my problem of always having too much cake and not enough people to eat it. I’m not going to wait for the cake to get stale before I make the cake balls, but rather slice off what we need, then mash, shape, and freeze the rest. Now I need to go buy a bunch of cake pop sticks and some sort of drying stand. Yum. I love a good lemon cake. This cake looks fabulous! I love lemon!!! I’ve made that cake, and love it. Yours is beautiful! Sounds delicious! Cake balls would be a great idea. Mmm looks delicious! It’s very beautiful. I love lemon cakes. That Fine Cooking lemon curd is the recipe I made for the coffee cake I was telling you about. It is an Elinor Klivan’s recipe and is really good. Cake looks good. I need to get that coffee cake blogged. That cake looks yummy and those cake pops sound delicious! So there’s no lemon juice in the cake itself, just zest? And please post the cake pops – I want to try them for a bake sale in early November! Yes, everything looks better surrounded in a little garland of leaves :). Thanks for noticing the Portmeirion. I love it. Looks great! Probably tastes even better!! Portmeirion always shows off a cake!